Brick Town Talk: Inspiration of the Day - 2/5/12 - LEGO Town, Architecture, Building Tips, Inspiration Ideas, and more! 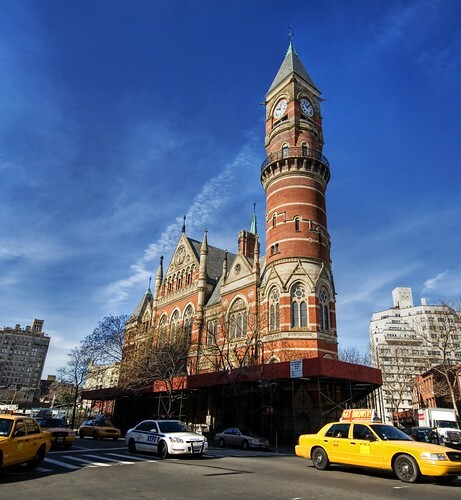 Greenwich Village, Manhattan - (BTT) A gorgeous example of Victorian Gothic architecture, the Jefferson Market Library, designed by Frederick Clark Withers and Calvert Vaux and completed in 1877, is yet another Inspiration that is lucky to still be standing. Originally built as the Third Judicial District Courthouse, the building saw its fair share of prominent trails, including that of Harry K. Thaw for murder of architect Stanford White, who has previously been featured on this site. Abandoned in the mid 1940s, the building was set to be demolished around 1958 until it was saved by a campaign to convert it into a branch of the New York Public Library. As seen by the scaffolding around the base in the picture above, the building might need a little touch up now and again, but thankfully won't have to worry about meeting a bulldozer ever again.